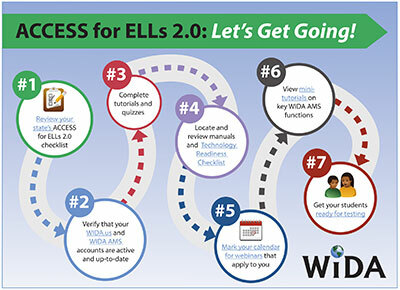 In 2016, the WIDA Consortium began administration of the annual summative assessment, ACCESS for ELLs 2.0. This page contains information needed for New Jersey educators to successfully administer ACCESS 2.0. Additional information specific to New Jersey may be found here. Please refer to your state's ACCESS for ELLs 2.0 Checklist for more information on who is responsible for each task related to materials management in your state. For students in grades K through 12, an ACCESS for ELLs 2.0 proficiency level of 4.5 or higher is recommended for exiting a program if multiple criteria support the decision.